I read this article and found it very interesting, thought it might be something for you. 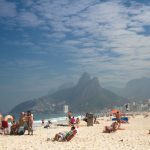 The article is called 10 Ways to Enjoy Ipanema Beach and is located at http://trip-n-travel.com/listicle/20771/. Here comes the sun, it’s summer time! 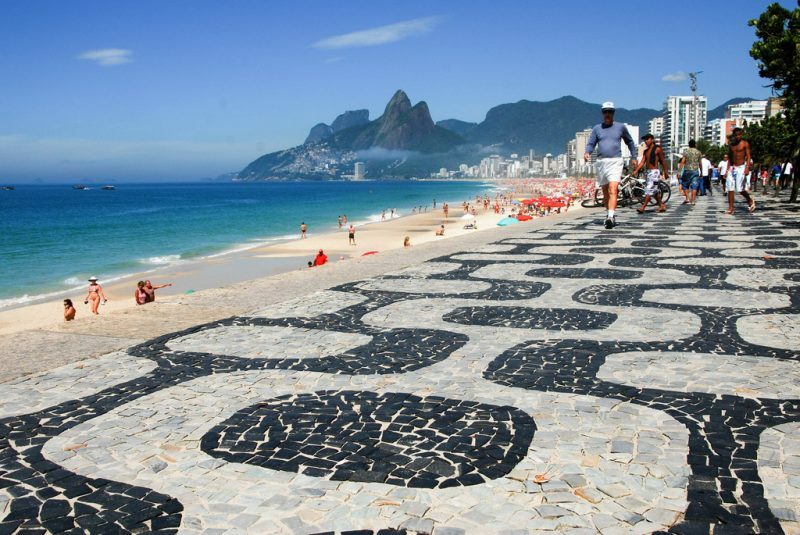 If you’re in Brazil this summer, make sure to visit Ipanema Beach. It’s one of the most iconic and popular beaches in the world, people are obsessed with it. 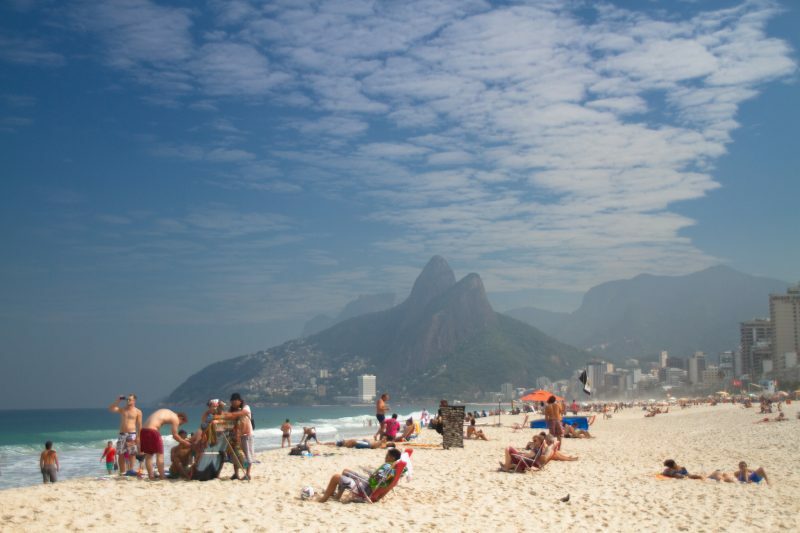 If you’re lucky to be around, here’s the things you can do at Ipanema Beach. 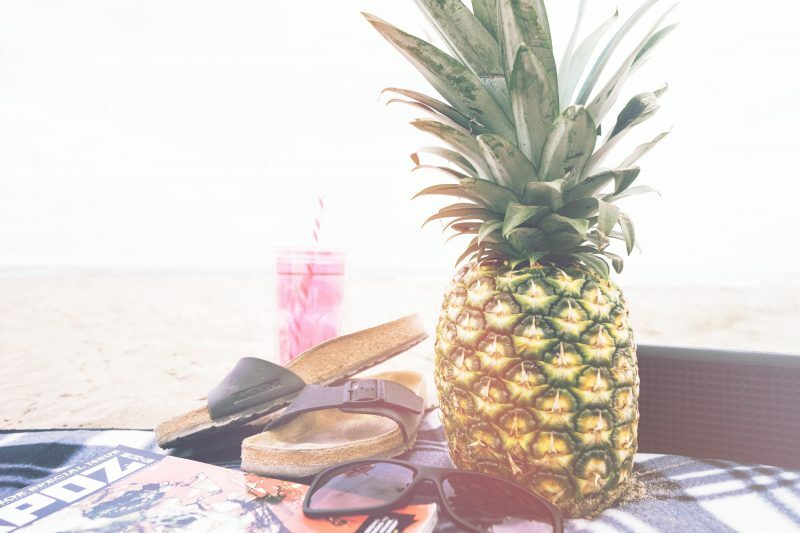 A summer at the beach will not be complete without a refreshing drink in hand. Here in Ipanema beach, you can have a beer or a freshly made Caipirinha. There are several snack bar selling it for you, and it’s completely legal to drink any alcoholic beverage at the beach. 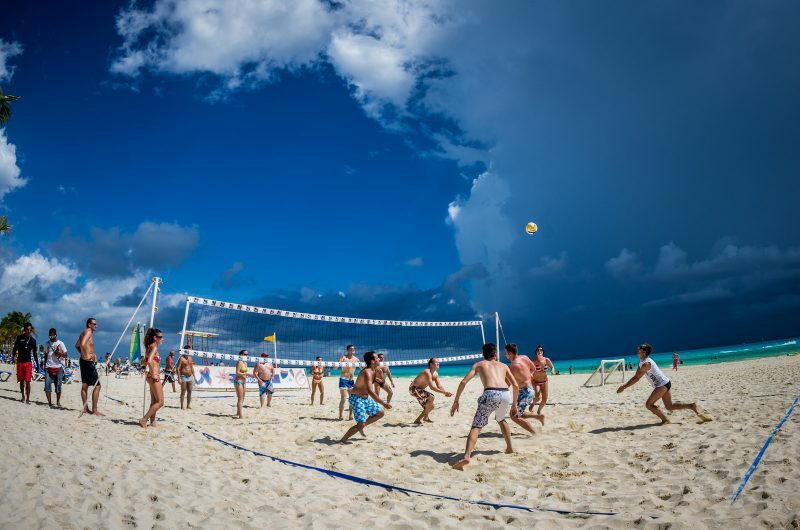 If you are into a sport, why not play football or volleyball at the beach? Or better yet, here in Ipanema beach, they have foot-volley which is a combination of football and volleyball. It was invented by the locals and it’s fun to play! You are welcomed to enjoy them. Yes, of course, you can go surfing here in Ipanema beach. In fact, the beach itself is quite famous as a surfing spot. The current is strong, though, here in Ipanema beach. So, if you are a beginner, we suggest that you take a surfing lesson before doing it yourself. Feeling hungry? Don’t worry, there are countless of snack bars available along the Ipanema beach. Most of them sell refreshing drink like juices, cocktails, coconut water, or some other freshly made traditional Brazilian drink. 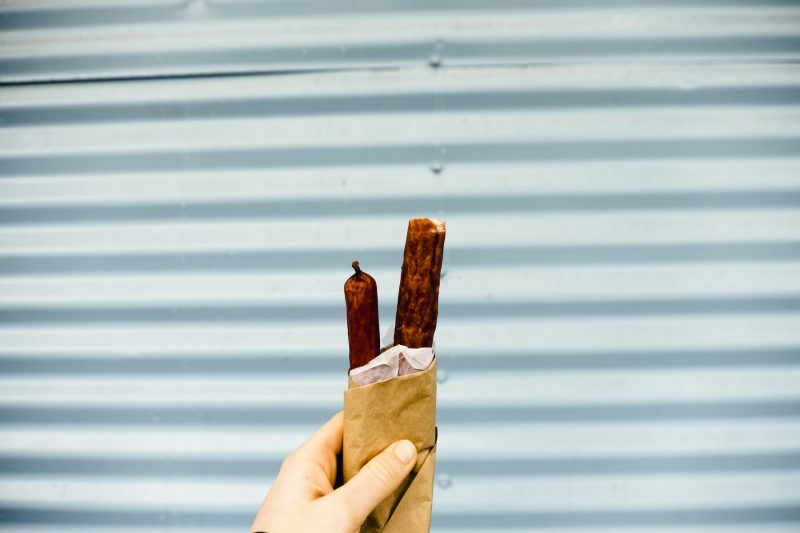 Some sell hotdogs, burgers, and also Brazilian snacks like Biscoitos Globo. 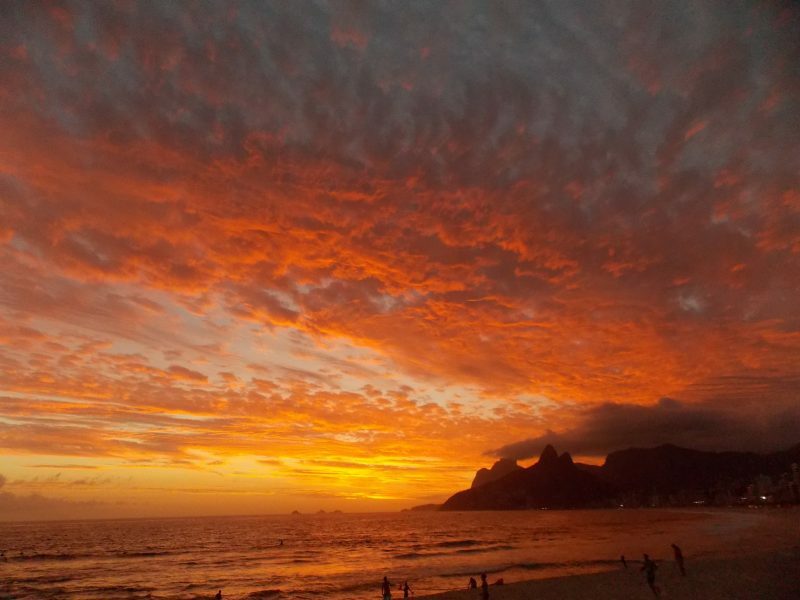 The summer sunset in Ipanema beach is simply stunning. Imagine the golden sky turning dark as the sun is setting. There is the view of Dois Irmãos mountains at the background that looks like a silhouette. Sometimes you will find the crowds applauding the sunset. It’s so gorgeous you don’t want to miss it. There are several fine restaurants or bars along the Ipanema beach. We think you might want to spend one special night in one of those restaurants after the sunset. It might get a little bit expensive but you’re paying for the nice view at one of the most famous beaches around the world. So why not? If you’re not into reading books at the beach, go for a stroll along the boardwalk. You’ll find many interesting things like people selling handicrafts or snacks, playing skateboards, bikes, and even rollerblades. It’s always nice to watch people having fun. It might sound a bit touristy, but who can resist these colorful handmade Brazilian souvenirs when it can remind you of the summer in Brazil? There are many other souvenirs like summer hat, flip-flop, handicrafts, and even painting. Just make sure to bring some cash with you. Also, a little bargain won’t hurt. Wait, haven’t we mentioned anything about swimming before? Of course, you got to go for a swim when you’re at the beach. Feel the salty refreshing water, dance with the wave. Soak yourself in the sun. It’s the best feeling of summer. It’s okay to feel lazy, especially in summer. Just head to the beach, enjoy the breeze. Soak yourself in the sun. Feel the salty air. Get tanned. The most important thing of all is to enjoy yourself. Because that’s what summer is all about.